Utagawa Kuniyoshi (1797-1861) Stories of True Loyalty of the Faithful Samurai Number 23: Katsuta Shinemon Takataka, 1847/48. Oban. Perhaps the most popular and best known of Kuniyoshi's work, this series celebrates the heroes of one of Japan's most enduring historical events: the 47 Ronin. In 1702 Lord Asano of Ako was provoked by Kira Kozukensuke into drawing his sword in the shogun's palace, for which he was forced to take his own life. Forty seven of his retainers became Ronin - samurai without masters. They vowed revenge on their leader and attacked Kira's palace the following year, decapitating him and carrying his head to lay on Asano's grave. They in turn took their own lives. This series is a very different type of warrior print from many of Kuniyoshi’s earlier work. These are heroes, gentle and thoughtful men... their gestures are often clumsy or considered; in many of the prints the incidental details are the bits and pieces of the domestic sphere and not the great axes or hammers, swords and war machines of the Suikoden or the Taihieki. 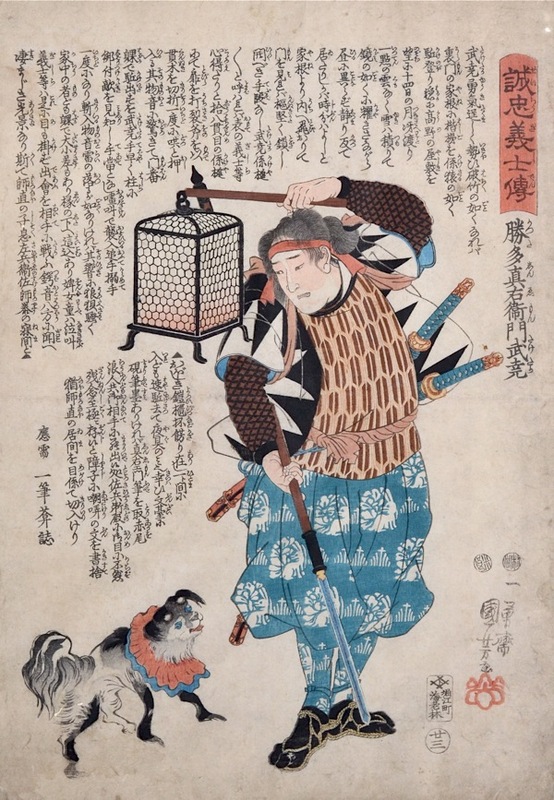 In this print we see Taketaka holding aloft an absurd lantern being pursued by an elaborately attired dog. In fact Taketaka was one of the boldest on the night of the raid, climbing into the compound and breaking down the gates for the awaiting fellow Ronin. Colour and impression are fine. Condition is good, but with surface soiling and damage to margins. Signed Ichiyiusai Kuniyoshi ga, published by Ebya Rinnosuke with censor seals and Kuniyoshi red kiri seal. The print is illustrated in Weinberg, Kuniyoshi: The Faithful Samurai, Hotei Publishing 2000.